Sizing the market for AI is difficult. It is not a product per se, but a powerful tool that can make almost any software significantly better, and will enable entirely new applications that have not yet been possible. AI’s value is magnified by the fact that so few organizations have the talent, data, and infrastructure to use it effectively. Writ small, the market size is still considerable – we believe AI-as-a-Service platforms will find $100B+ in sales within 10 years. Writ larger, AI leaders will be able to dominate market opportunities for transformative system solutions across all sectors of the economy, and in some cases, disrupt existing business models entirely. Digital advertising and e-commerce are the early examples where cutting-edge AI is already helping leaders (GOOGL, FB and AMZN) harvest market share from old-school rivals in global markets worth many $100’s of billions. MSFT and CRM expect to use AI as a wedge to pull horizontal enterprise applications away from IT incumbents. Industry specific opportunities exist everywhere – a McKinsey study found $3T in potential labor cost savings from AI, without considering the potential improvements in products and services. Finally, we believe that AI could catalyze major disruption in many businesses – e.g. robo-taxis/autonomous trucking in transportation, fraud prevention/risk assessment for consumer banking and insurance, or AI diagnosis and patient care support for healthcare. AI is a tool that can improve almost any software. Deep learning allows software to find optimal results to ambiguous questions, often hidden in massive data sets. With this tech, applications can better predict future outcomes, can deliver better analytical conclusions, can be personalized to specific users and adjust to specific circumstances, and can communicate more naturally and infer intentions. These advantages are extraordinary, and we believe that applications that make effective use of AI will crowd out most traditionally developed solutions over the long run. We also believe that AI will enable new applications that will catalyze major disruption in some sectors of the economy. 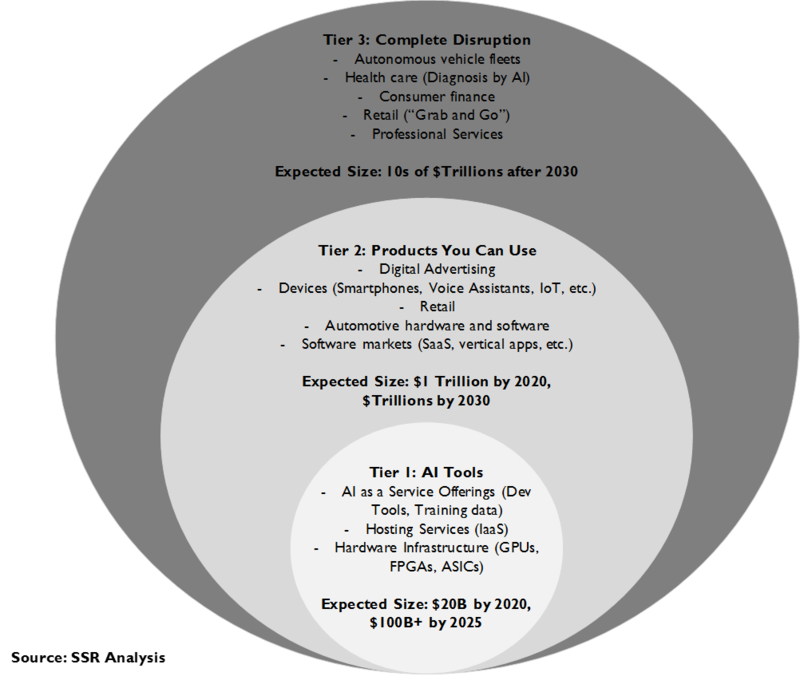 The 3 tiered AI market. Deep learning, which is a subset of machine learning (ML), which itself is a subset of artificial intelligence, will create market value at three levels. The first level comprises the tools (i.e. 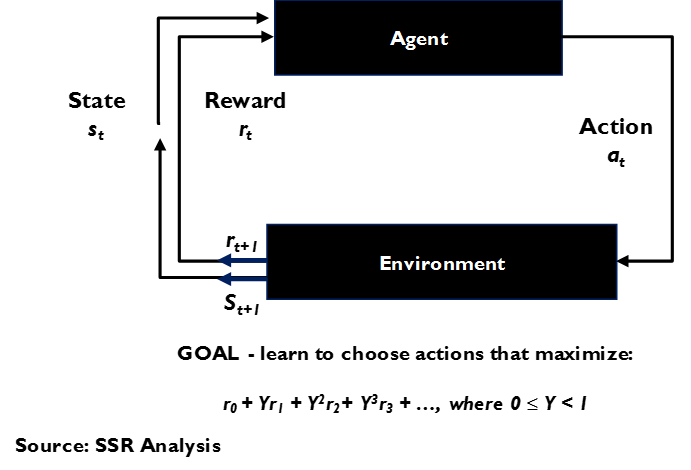 algorithm libraries, labeled data sets and pre-trained modules APIs) and the infrastructure need to support them (i.e. AI focused cloud hosting, GPUs, FPGAs and AI tuned ASICs). The second are the devices (e.g. smartphones, autonomous driver assist systems, AR glasses, connected home systems, etc.) and applications (e.g. virtual assistants, AI enhanced data security, fraud prevention systems, smart productivity apps, etc.) that will be directly reliant on AI’s unique capabilities. At the third level, existing industries will be disrupted by new AI-powered alternatives (e.g. robo-taxis, unstaffed grab-n-go retail, significantly lower risk consumer finance, AI enhanced health care, etc.). AI-as-a-Service. The skills, data and infrastructure needed to develop world-class AI are in very short supply. A few companies with these prerequisites (i.e. GOOGL, MSFT, AMZN, IBM, and BIDU) are investing heavily to offer hyperscale datacenter infrastructure tuned to the needs of AI with development tools, like programming libraries (e.g. 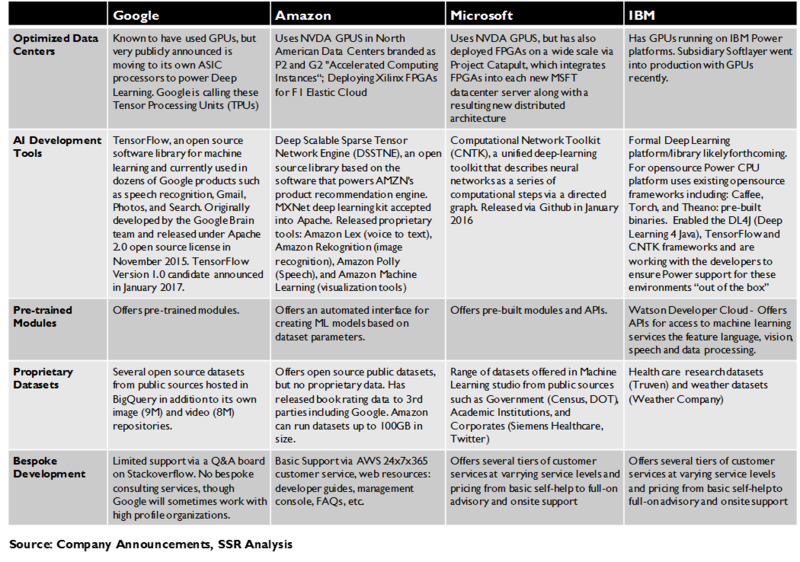 GOOGL’s TensorFlow, MSFT’s CNTK, the open source Torch and others), proprietary labeled data sets, and pre-trained modules available as APIs. We believe that the vast majority of AI-enabled systems deployed by companies outside of the top tier will rely on these AIaaS platforms. This will also drive the market for AI focused datacenter components, like GPUs and FPGAs. We believe that AIaaS will drive $10’s of B in annual IaaS business within 5 years, with a long-term potential in the $100’s of B.
AI enabled devices and applications. We believe that integrated AI will become major point of differentiation in many consumer devices, led by the $450 B smartphone market. AI-based driver assistance has already become a major feature in cars, sparking a $1B+ market for self-driving subsystems. Virtual assistants will migrate to many new device platforms, paid for by a combination of licensing fees, advertising and facilitated e-commerce. AI will greatly enhance enterprise application software with superior analytics, new predictive capabilities, and highly personalized interfaces, with huge share shifts toward the SaaS leaders able to exploit it. Industry vertical software will also be transformed by AI, with high value applications across all sectors of the economy. Already, AI-enabled solutions dominate digital advertising and e-commerce – we expect the success to continue. We believe that this tier of opportunity is already well into the 100’s of $B, and see the long-term market in the $Ts. AI powered disruption. We believe leading edge AI could precipitate new business models that could displace major sectors of the economy. A vision of on-demand transportation provided by fleets of AI powered robo-taxis displacing private car ownership has passed from fantasy to accepted narrative. Similar disruption is possible in consumer financial services (low risk AI lending/insurance), healthcare (AI preventative care/diagnosis/treatment protocols), retail (self-serve stores), security (threat ID and resolution), and other areas. These very long term opportunities may still favor today’s AI leaders, depending upon how quickly the technology is democratized, and potentially address many $T in future sales. Leaders and focused startups. As we have written, AI talent and tuned hyperscale datacenter capacity are tightly concentrated to a small subset of leaders (i.e. GOOGL, MSFT, FB, IBM, AMZN, and BIDU), with a range of motivated challengers (e.g. CRM, Uber, ADBE, AAPL, BABA, etc.) investing furiously to catch up. There are also application-focused smaller players levering their AI capabilities against specific opportunities (MBLY, startups). We expect Tier 1 opportunities to be dominated by the leaders and their suppliers. 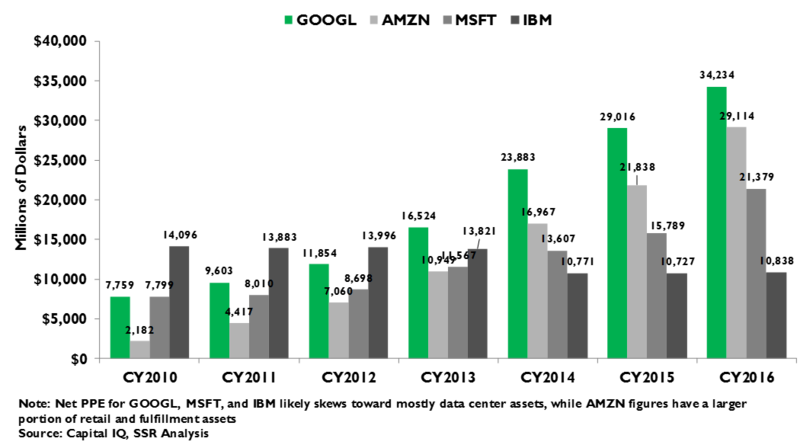 Challengers and startups are more active in Tier 2 opportunities, particularly where industry expertise and proprietary data are additional prerequisites. Tier 3 opportunities are still further away, and the eventual champions may not yet have emerged. Still, the talent advantages and long-term investment horizon of many of the leaders suggest that they will contend for dominant stakes in disruptive businesses, like autonomous taxi fleets or AI-managed grab-n-go convenience stores. How Big Does It Get? Artificial Intelligence (AI) is not a product, rather it is a set of programming techniques that allow computers to better cope with ambiguous input and provide optimized output. Machine Learning (ML) is a category of these techniques that use feedback loops to automatically adjust algorithms over many iterations based on the quality of the results that have been derived. Deep learning is a subset of ML, which combines these recursive algorithms into multiple layers that inform each other and allow more complex problems to be addressed. 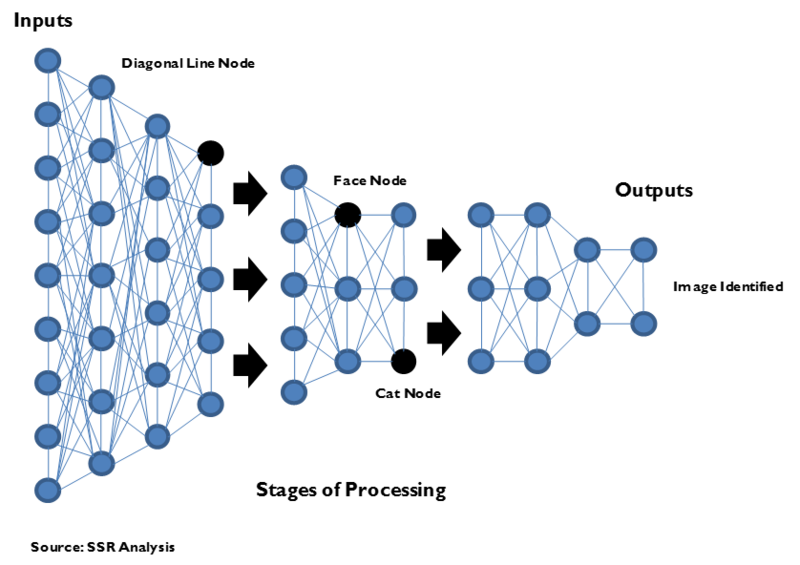 The most complicated deep learning systems may have many thousands of algorithms organized into a dozen or more layers. Once trained on appropriate datasets, deep learning modules can then be incorporated into software applications, adding new functionality like natural language inputs, image analysis, superior forecasting, hyper-personalization, or autonomous controls, for example. Because AI is a tool rather than a specific product, the size of the addressable market is a matter of perspective. We think of demand for AI in three tiers. The first, is narrowly defined as sales of the tools themselves, mostly as part of AI-as-a-Service cloud hosting platforms. Also in this first tier, we would include hardware components tuned specifically for AI, and customized development services. The second tier comprises devices and applications that are substantially improved by AI – smartphones, vehicle subsystems, digital ad platforms, recommendation engines, enterprise SaaS applications, and many others. The final tier contains opportunities to disintermediate existing businesses – e.g. robo-taxi transportation as a service, or fully automated “grab-n-go” retail stores. We believe that the first tier will be dominated by a handful of companies – GOOGL, MSFT, AMZN, IBM and BIDU, supplemented by suppliers like NVDA, and XLNX – addressing a market expected to grow to $10B+ by 2020 and $100B+ by 2025. The second tier is much bigger – arguably GOOGL, FB and AMZN’s core businesses are already heavily AI driven. Combining the opportunities from smart devices, vehicle components, e-commerce, digital advertising, SaaS enterprise applications, and vertical industry solutions puts the addressable value into the $ trillions within 10 years. The top AI firms (GOOGL, MSFT, FB, IBM, AMZN, BIDU) will be challenged by aggressive rivals (e.g. CRM, AAPL, ADBE, Uber, BABA, and others) who are investing heavily to build AI competence. Finally, AI-enabled businesses will eventually disrupt major sectors of the global economy. We are firm believers in the inevitability of on-demand autonomous transportation displacing privately owned vehicles. Similarly, we see consumer financial services, healthcare, and brick-and-mortar retail as sectors ripe for AI-powered disruption. These opportunities may take decades to play out, but could be many trillions of dollars in eventual size. It is way, way too early to call winners, but we are comfortable in projecting the top companies, with their substantial advantages in talent, data and infrastructure, playing a major role. In particular, we see GOOGL, MSFT and AMZN positioned against multiple huge AI-enabled opportunities – considerable long term support for valuations that some investors find harder to justify on just the short-term trajectory. We are also enthusiastic for the component suppliers for AI-tuned datacenters, specifically NVDA and XLNX, but potentially, AMD, QCOM and even INTC. We are also bullish for CRM, ADBE, and BIDU, with IBM likely to be a long term winner even if its core business struggles continue. Artificial Intelligence (AI) is not a product. It is a family of software programming techniques that enable computers to draw optimized conclusions from ambiguous data. Within AI are category of techniques called Machine Learning (ML) that have shown the most promise. The idea of ML dates to the earliest days of the computer. In the 1950’s, a cadre of data scientists developed algorithms that adjusted themselves as they iterated through data, based on the relative success or failure of their operations. These algorithms were patterned on the mechanisms thought to occur in neurons in the human brain. However, to achieve anything commercially useful, this “neural networking” technique required data and processing resources that were far, far beyond anything imaginable at the time. As such, the technology was deemed esoterica and pursued only by the most impractical of computer scientists. With time, the rise of web-scale businesses, and particularly, internet search pressured previous limitations on database size and datacenter scalability. These massive data sets and hyperscale computing facilities forced breakthroughs across computer science, opening the door for the commercial applicability of ML. Deep Learning (DL), a branch of ML that employs complex layers of recursive algorithms in order to address more complex problems, began gaining traction in the leading web-based businesses, with search rivals Google and Microsoft in the lead (Exhibits 1-2). Today, computer scientists are making dramatic progress in pushing the capabilities of deep learning solutions, evidenced by the progress in areas like self-driving vehicles, natural language interpretation, translation, image identification, predictive analytics, and strategic game playing. However, the spread of AI is still limited by the scarcity of its three main ingredients: scientific talent, massive datasets and AI-tuned hyperscale datacenter capacity (Exhibit 3). We have written about all three of these ingredients (http://www.ssrllc.com/publication/ai-where-the-brains-are/, http://www.ssrllc.com/publication/twtr-data-is-gold-in-an-ai-world/, http://www.ssrllc.com/publication/37440/) and of the nascent move to offer AI-as-a-Service (http://www.ssrllc.com/publication/ai-as-a-service-deep-learning-is-fundamental/) that could catalyze a democratization of the technology to a much wider universe. With this piece, we are looking to understand the dimensions of that universe. Sizing the market for a tool like AI is tricky (Exhibit 4). At its narrowest, the market is for AI provided as a service on hosted platforms, along with the specific hardware infrastructure necessary to provide AIaaS. Alphabet, Microsoft, Amazon, IBM and Baidu have all invested in offering AI-tuned datacenter capacity, programming libraries, proprietary datasets, and pre-trained APIs for commonly required functions like speech recognition or translation. 3rd party customers have begun to pay for these capabilities, which also create a stickiness for hosted applications with substantial data and processing needs. As machine learning becomes ever more pervasive, we believe most hosted software will have an AI component, making the technology a prerequisite for an IaaS market that we expect to push into the $100’s of billions within 5 years. The second tier of the AI market are the products and services that depend upon AI integrated into its functionality. This tier is already much larger than many suspect, given that most digital advertising placement is already heavily dependent on AI-heavy systems and that the leading platform for e-commerce has embedded AI into its product recommendation process on one side and its logistics on the other. Add in smartphones, which have begun to lean on AI-powered voice assistants for their newest bells and whistles, and the existing markets are already well into the $100’s of billions with potential to move into the trillions of dollars in the next decade. On the device side, connected nodes on the long-hyped Internet-of-Things (IoT), increasingly smart private automobiles, and augmented reality glasses will all require AI to work. On the application side, Microsoft and Salesforce plan to use AI to foment revolution in enterprise software, IBM is looking to build bespoke AI solutions for organizations with more data than IT talent, and all manner of consumer facing businesses will use AI to provide much more personalized service. Finally, we believe AI will spell complete disruption for some sectors of the economy, creating opportunity for entirely new business models. The obvious example here is the now common vision of fleets of robo-taxis replacing many privately-owned vehicles with on-demand transportation-as-a-service. 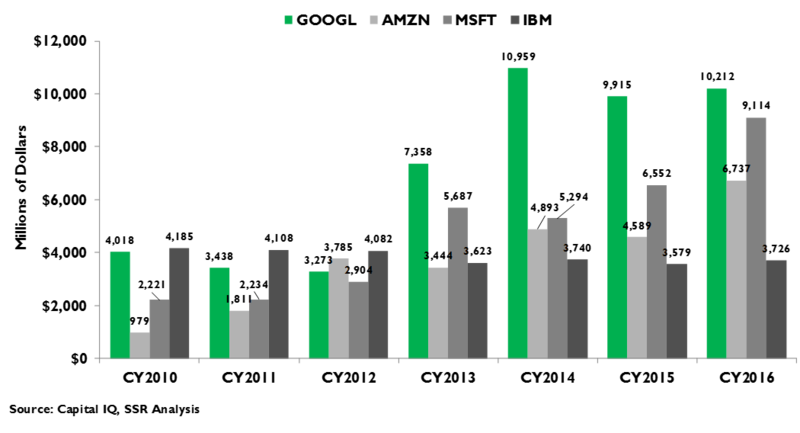 Other industries that would seem ripe for disruption are consumer finance (AI helps eliminate fraud risk, optimizes credit scoring and insurance underwriting), healthcare (AI tools for predicting, preventing, diagnosing and treating disease), legal services (AI written documents and research), and retail (AI managed grab-n-go shops without cashiers, AI-powered drone delivery). This could obviously amount to many trillions of dollars of value and much of it could be captured by the companies that most effectively wield the AI tool. We have written extensively on the AI-as-a-Service opportunity (http://www.ssrllc.com/publication/ai-as-a-service-deep-learning-is-fundamental/). While the specific demand for compute time on the ASIC, GPU and/or FPGA powered AI infrastructure available on the IaaS platforms offered by Amazon Web Services, Microsoft Azure, Google Cloud Platform and IBM Watson Cloud amounts to a tiny piece of total demand, we expect it to begin growing quickly this year (Exhibit 5). Google is in the technical lead, with its signature TensorFlow development library (contributed into open source but still closely associated with the company) a popular rubric for AI scientists and its proprietary ASIC TensorFlow Processing Units (TPU) a highly efficient platform for training and running deep learning systems. Moreover, Google offers scrubbed and labeled training data (10 million images and 8 million videos) to its customers, along with pre-trained modules for speech to text, language translation, image classification and predictive analytics that can be accessed via APIs on the Google Cloud Platform. It recently lured well known Stanford AI scholar Fei Fei Li and Snapchat research head Jia Li to lead the expansion of the AIaaS public platform. Microsoft Azure has similar offerings, although its CNTK development library is not as popular as Google’s TensorFlow and it relies on a combination of Nvidia GPUs and Altera FPGAs rather than a proprietary ASIC for its hardware platform. Microsoft offers APIs for speech-to-text, translation, image classification, and facial recognition, but has not made training datasets available. Amazon has hired former Google scientist Alex Smola from his department leadership post at Carnegie Mellon University to head the development of its own AIaaS platform. Currently, it supports most open source libraries like Torch and TensorFlow with Nvidia GPU based hardware. IBM is looking to AIaaS to gain ground in IaaS. It is reputedly working on its own development rubric, while currently supporting the same set of open source libraries as AWS. It has a partnership with Nvidia to drive development of AI hardware, it offers access to proprietary data sets, including detailed historical weather data and more than 400M patient healthcare records. It also recently acquired Alchemy API, which added 15 different pre-trained AI modules available as API for Watson Cloud customers. We believe AI functions will be integrated into a growing percentage of the software hosted by these platforms, increasingly driving decisions to transition applications into the public cloud. 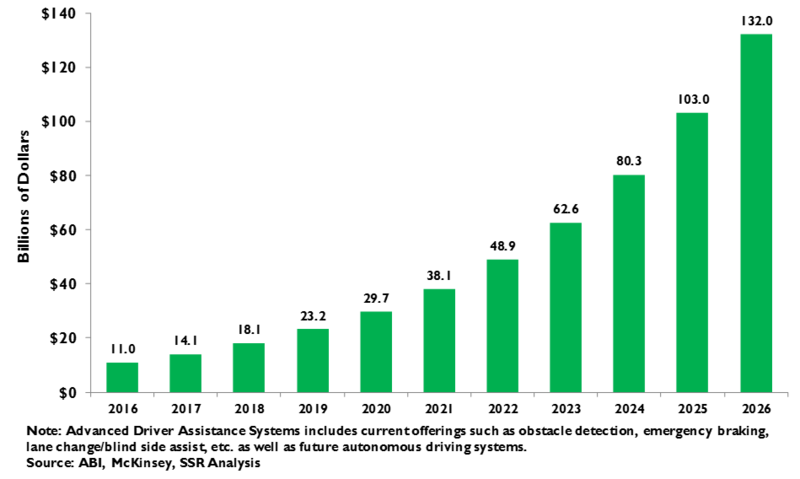 In 2017, spending on AIaaS will certainly be less than $1B, although capex on AI infrastructure components could be above that figure (Exhibits 6-7). However, by 2020, hosting contracts which include AI will likely make up more than 5% of an IaaS market that we expect to easily top $100B. By 2025, we expect AI to drive more than $20B in hosting contracts, and in the long term we expect AI to become a nearly ubiquitous part of a trillion-dollar global business. Powerful AI-tuned computing infrastructure, support for sophisticated programming rubrics, and extensive pre-trained API lists will be prerequisites for hosts and amongst their stickiest, highest margin services. AI technology already plays a critical competitive role in huge, commercially successful businesses. 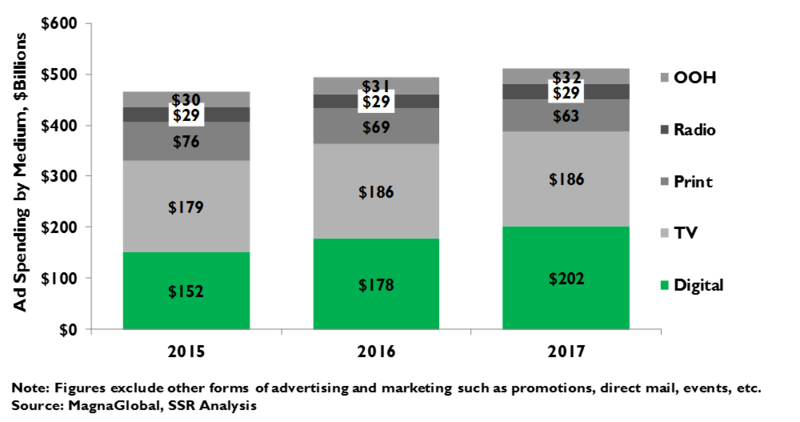 Digital advertising spending is projected to top $200B of the nearly $500B in total measured media ad sales in 2017 (Exhibit 8). A majority will be captured by Google and Facebook, both of which use highly sophisticated AI to sell and place ads, as well as employing the technology extensively into their consumer platforms. 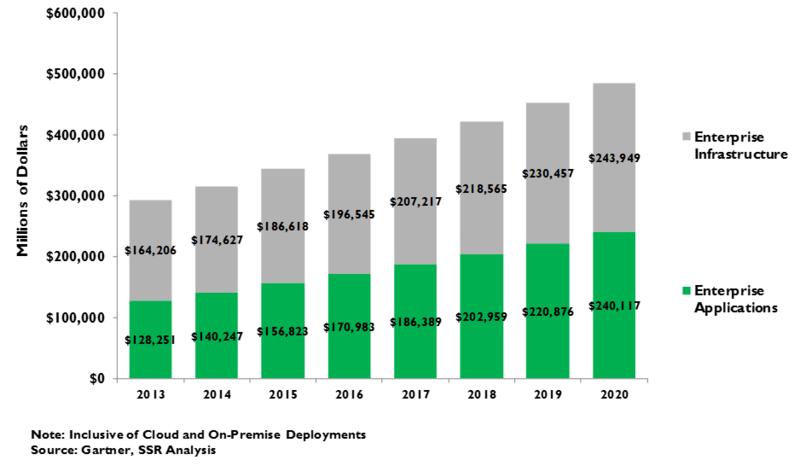 We note that digital advertising targets not just the TV, print, radio and outdoor ads included in the standard measures of the industry, but also another $600-800B in spending on non-media marketing and promotions, making the addressable market well over $1T. Likewise, e-commerce king Amazon uses deep learning to recommend appealing products to its shoppers, to root out fraud, and to improve the efficiency of its logistics. While the Amazon juggernaut was built without the benefit of AI, the technology now gives it a considerable service quality and cost advantage vs. its would-be rivals. We believe that it is now a pre-requisite for long-term success in the more than $2T e-commerce market that threatens more than $10T in global retail spending, and likely, the $14T global wholesale distribution market as well. Much has happened in the world of AI assistants since Apple launched Siri in 2011 (http://www.ssrllc.com/publication/ai-assistants-the-next-user-interface-paradigm/). Microsoft’s Cortana, Amazon’s Alexa and most recently, Google’s Assistant have looked to one up each other with their ability to understand commands accurately and execute increasingly wide range of tasks, while extending their presence to an increasingly wide arc of devices. We believe that the AI assistant will supersede the app model as the primary user interface for consumer electronics, in the process becoming the primary point of differentiation for nearly a trillion dollars of spending on smartphones, PCs, tablets, wearables and other gadgets. The “internet of things”, a much-hyped vision of billions of sensor-equipped endpoints networked together by low-power, low-cost 5G wireless technology, could add many new applications for these hyper-personalized and predictive AI assistants. Altogether, AI-powered devices will be a trillion dollar plus addressable market. Automotive is another major market for AI. Setting aside the long game of autonomous fleets providing on-demand transportation as a service, automakers are beginning to differentiate on AI-enabled driver assistance features, like Tesla’s “Autopilot”, various companies’ automatic parking, and other safety/convenience capabilities. Moreover, the same AI assistant that serves a user in their home is easily adapted to the car. Parts and software for Advanced Driver Assistance Systems (ADAS) are roughly an $11 billion-dollar market today with potential for 30%+ annual growth for the next decade (Exhibit 9). We have also written about Microsoft’s plans to use AI to revolutionize enterprise application software (http://www.ssrllc.com/publication/msft-an-ai-powered-vision-for-the-future-of-enterprise-computing/). As organizations migrate to Office 365 and other SaaS applications, Microsoft can use the data generated by users to provide management deep insight into the mechanics of their organizations, helping to guide critical decisions on product development, resource deployment, sales strategy, and many other key business areas. It would also use AI to build a powerful, intuitive user interface that could bridge across applications and venues, anticipating the needs of employees and boosting productivity. The LinkedIn acquisition, which brought a leading HR talent management SaaS application and a mountain of data on professional connection, plays directly into this strategy. We note that Salesforce, which has been acquiring/hiring AI talent at a fierce pace and recently launched its Einstein platform for building AI into its own applications, appear to be committing to a very similar course. If the market plays out as we expect, AI prowess will be a powerful differentiator here as well, swinging competitive balance in the $400B+ market for enterprise software (Exhibit 10). AI will also find its way into many industry-specific vertical applications – manufacturers optimizing automated processes and planning maintenance, pharma companies using AI to accelerate drug discovery, agriculture firms using weather and growth data to optimize crop yields, energy companies maximizing the output of rigs, government agencies predicting and preventing crime, and many, many others. Wherever improving the speed and quality of analysis and predictions, automating regular tasks, increasing the personalization of systems, or raising the accuracy of identifying and categorizing anything can add value to an organization, AI is a powerful asset. Thus far, IBM has been the company most active in pursuing these vertical opportunities, offering bespoke application development support to its Watson Cloud and to AI tuned commercial servers sold to customers preferring to keep their AI in house. There are also ranges of start-ups looking to address needs in many of these areas, particularly in healthcare, and we expect many more to launch in the future. Some of this demand may be served via the AIaaS platforms we defined in Tier 1, but we believe that the 2025 market for specialized vertical applications relying on AI will be well into the 10’s of billions of dollars. In total, we believe AI-enabled applications and products are already a $250B market that could grow tenfold over the next decade, addressing many trillions in possible opportunities. Other research supports our assertions (Exhibit 11). 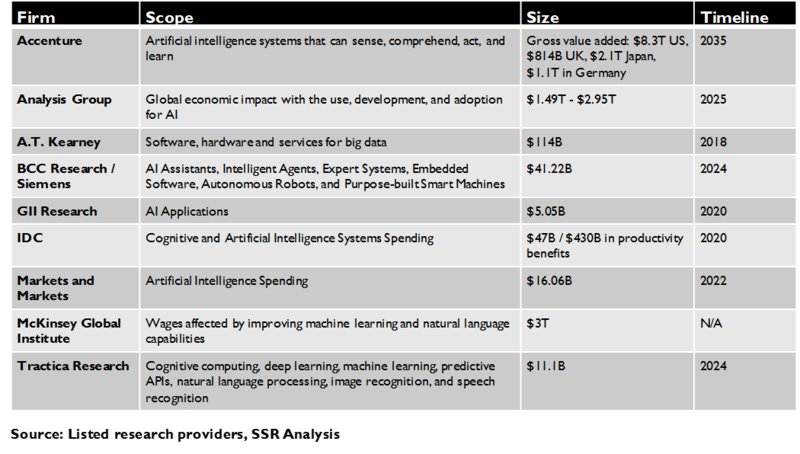 The Analysis Group recently published analysis of the potential impact of AI technology on global GDP, estimating $1.5T to $3T in aggregate economic benefits over the next decade based on its assessment of the impacts created by similar technology paradigm shifts. The McKinsey Global Institute surveyed executives in 12 global industries, identifying at least 3 AI-based applications in each that would have significant impact in their businesses over the next decade. McKinsey projects that as much as $3T in annual labor savings could be achieved if all the identified applications were universally adopted. Clay Christensen has an elaborate definition for business disruption requiring that the new product or service come from below, serving a niche market that at first seems too inconsequential for incumbent players to adjust their well-established business models to address. Over time, as the disruptor gains experience, the technology improves and as user needs evolve, the niche grows to overwhelm the established order. AI technology could catalyze this sort of sea change in a variety of market sectors. The obvious example is transportation. The model of private vehicle ownership, supported by an array of dependent businesses (service stations, parking lots, insurance, etc.) and government investment (roads, signs, traffic police, etc. 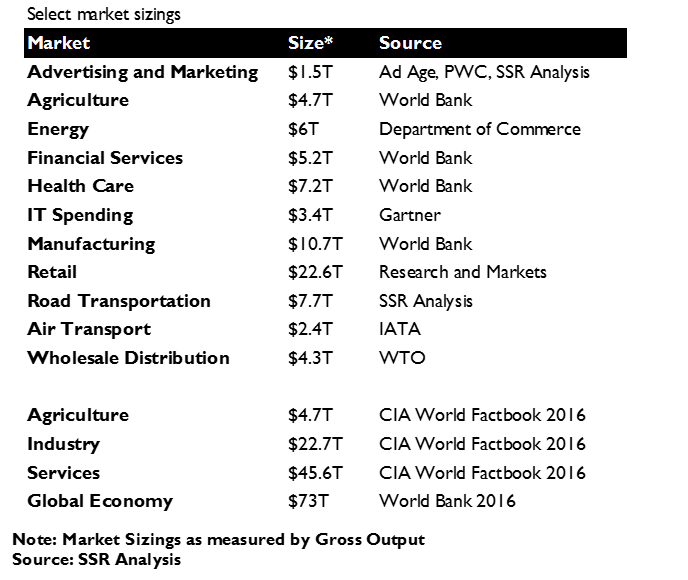 ), has played out for more than a century and generates $7.8T in global spending annually (Exhibit 12). Uber began the disruptive assault on private cars, levering the smartphone to link riders with vehicle owners willing to provide a ride. Initially, the target market was perceived as taxis and livery services – a small, high priced and highly regulated corner of the transportation market – but eventually Uber began to appeal to urban and suburban consumers who saw the service as a replacement for their own cars. AI has the potential to supercharge this – cutting the costs of service by at least half, while raising the bar for safety and convenience. Governments have begun to see the myriad benefits of fleets of robo-taxis – great improvements in safety, reduced pollution, lower infrastructure requirements, free space from eliminating parking, and superior service for citizens in need (the elderly, children, the disabled, and other shut-ins). We believe that fleets of autonomous vehicles offering on-demand transportation-as-a-service will emerge in a few cities before the end of the decade. (http://www.ssrllc.com/publication/autonomous-cars-self-driving-ambition/) We expect those early adopters to demonstrate the enormous utility created by the new business model and for most governments to actively encourage investment in spreading the paradigm to new markets. By 2025, we believe numerous global cities will have approved franchises for robo-taxi fleets, with substantial market momentum pointing toward broad adoption. By 2030, we believe that transportation-as-a-service will be having a clear deleterious impact on global demand for private cars and their support services, with revenues in the $100s of billions. In the very long run, private vehicles could become an unusual luxury for the driving enthusiast and an expensive necessity for rural residents. Autonomous driving will also disrupt long-haul trucking – another $2.2T addressable market – and along with AI-controlled drones, the $86B local delivery market as well. Other forms of transportation – planes, trains, ferries, etc. – will also be fair game for autonomous operation. Healthcare is another field ripe for disruption – IF regulation sees fit to enable it. The first implementations will be in emerging markets, where AI can ease the shortage of qualified medical professionals – offering predictive modeling, administration and tracking for preventative care, accurate testing and diagnosis for the sick, and optimized treatment protocols personalized to the patient’s exact condition. The same paradigm could obviously drive better outcomes at lower costs for developed countries as well. Clinical healthcare is a $7.2T sector globally (Exhibit 13). AI could play other roles as well – it is already being implemented by pharmaceutical companies looking to hasten the path to effective molecules. Consumer finance is another highly-regulated business where AI could enable entirely new paradigms. Combined with biometric identification, sophisticated AI-powered fraud prevention systems could largely eliminate transaction risks. Similarly, AI models could dramatically improve credit scoring and insurance underwriting, reducing risks and lowering servicing costs for commercial services as well as consumer. Money management and trading could also be effectively targeted by AI-powered competition. In all, trillions of dollars in fees could be disrupted. Retail could face further consequences beyond the ongoing incursion of AI-enabled e-commerce. Amazon is experimenting with physical store formats that eliminate cashiers in favor of AI systems that sense a shopper’s identity from their smartphone and facial recognition, then recognize the items taken from shelves and automatically register the purchases when the customer leaves the store. “Grab and Go” formats, automatically anticipating inventory needs while robotically stocking shelves and/or preparing food, could be a superior alternative to traditional stores in many categories. Add on robo-cab or drone delivery options and the target market grows wider. AI could also displace many professional services. For example, most legal documents – contracts, wills, trusts, divorces, leases, etc. – could be written and reviewed by well-trained AI systems. AI systems for tracking precedent through volumes of case law and for evaluating written evidence have already begun to appear. Deep learning systems have learned to dominate professional poker players, suggesting they could be relied on for negotiations as well. Indeed, future generations may read the “Lawyer Jokes” from our era and scratch their heads in confusion. 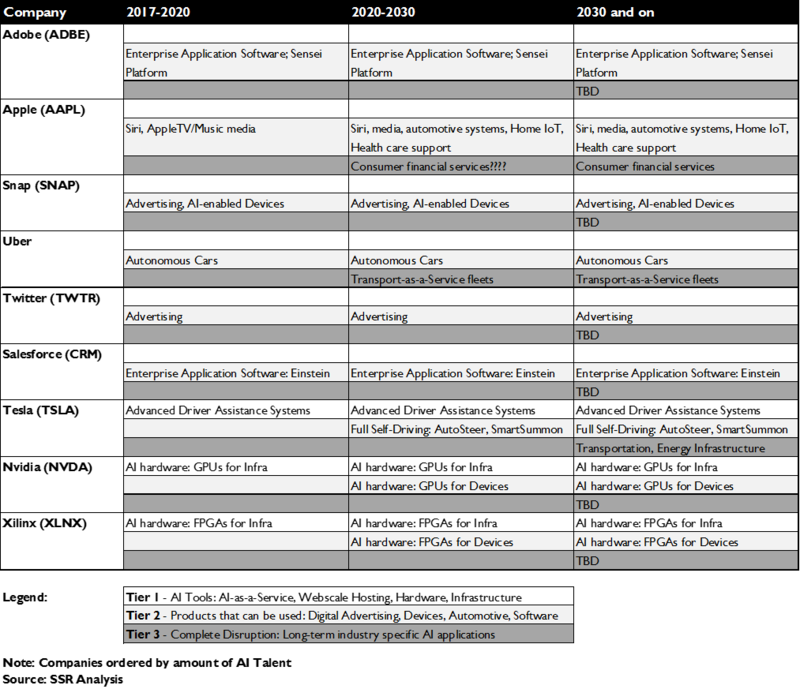 Organizing the AI addressable market by tier and time suggests decades of extraordinary growth. Near term opportunity – through the end of the decade – is well established in both Tier One and Tier Two (Exhibit 14). We expect at $5-10B annual market for AIaaS hosting to arise in that time, with a slightly lower target for AI specific datacenter components. 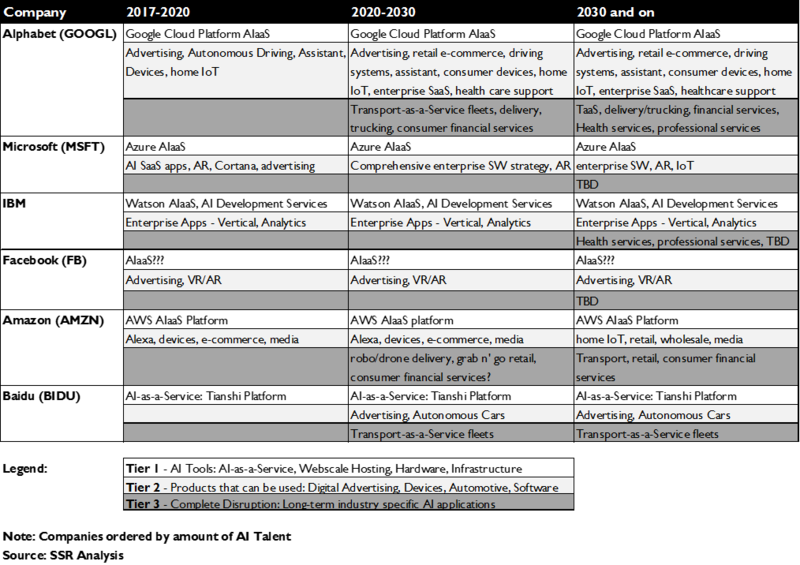 In Tier Two, AI-powered digital ad platforms will top $300B in yearly sales, more than $1T in annual total merchandise volume will move over AI-rich e-commerce platforms, AI will be a key differentiator in the sales of more than $600B in devices, and enterprises will spend $100B/yr+ for AI-enriched applications. Most of this opportunity will accrue to a dozen or so AI technology leaders, with Alphabet, Microsoft, Facebook and Amazon at the top of the list. The second phase of AI value creation will playout in the following decade – roughly 2020 to 2030 – when Tier One hosting will mature to a $100B+ annual business. The early AI leaders will compete aggressively to protect business gains from increasingly competent rivals for the multiple trillions of dollars in addressable Tier Two opportunities – e.g. advertising, e-commerce, web-based services, consumer devices, enterprise application software, and automotive systems. The “app model” for interfacing with personal devices will become the exception rather than the rule, as AI virtual assistants become the UI of choice. Potentially disruptive paradigms will find their niches – Autonomous robo-taxis will operate in dozens of cities and generate $10’s of billions in revenues, less developed countries will welcome AI-enhanced healthcare approaches and governments in developed nations will take clear notice at their progress. AI will find its way to circumventing the stifling regulation in consumer finance – perhaps as part of mobile payments – leading to the formation of non-traditional “banks”. AI-first companies will posit now unanticipated market opportunities. The golden age of AI will likely play out thereafter. Most applications, both consumer and enterprise, will employ extensive machine learning to hyperpersonalize interfaces and functionality, to anticipate needs and optimize predictive analytics, to communicate naturally, to cope with ambiguous inputs, and to interpret the world. Most of those applications will be hosted on AIaaS cloud platforms, or operate at the device level on AI-tuned hardware. The transformation of disrupted industries will see the emergence of new leaders embracing the AI-first paradigm. It is not clear who these disruptive leaders will be – Current incumbents who disrupt themselves? Today’s AI juggernauts? Or, most likely, new companies able to lever the democratizing effects of AIaaS to establish the model that gains traction. AI thought leaders, like Baidu and Stanford University’s Andrew Ng, liken the advent of AI to the rise of electricity in the late 18th century. The first systems were limited in ambition – typically designed to power municipal lighting. Within a few short decades, electricity would catalyze massive paradigm shifts in nearly every part of the industrial economy, powering factories, enabling communications, and changing day-to-day life for almost everyone. We believe that AI can be nearly as transformative and will be wildly lucrative for the companies with the foresight to invest against that eventuality.